Rabbits have body language unique to their species that you will want to understand in order to enjoy your lives together. 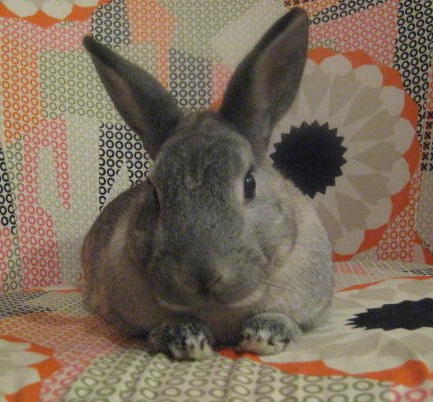 A bunny sitting with its paws tucked in and eyes half closed, or stretched out with their legs kicked behind them, is relaxed and content. A bunny that rolls over onto its back and shows its tummy (the “flop”) is REALLY content. Ears up means they are listening intently, ears back may signal aggression, as does grunting, lunging, or boxing with the paws. Alert posture with wide eyes and a rapidly wiggling nose shows fear and anxiety. Rubbing of the chin on objects (or you) is a claim on marked territory. Sitting up on the hind legs ("periscoping") is a surveillance tactic. Circling your legs and softly “honking” means they wish to court you as their mate. Approaching you and lowering their head, sometimes with a nudge, is a request for petting or grooming. Gentle grinding of the teeth is a bunny’s version of purring, while much louder, more intense grinding signifies pain. A zig-zagging dance move, complete with 180º flips in the air and a shake of the head (commonly called a "binky") is a definite sign of feeling playful (or mischievous) and nearly bursting with joy. Rabbits feel most comfortable when they have good traction- their feet are padded with fur, making gliding across slippery floors unnerving. On the other hand, it will be much easier to clean the habitat if it is on hard flooring than it would be on carpet. If you have wood, vinyl, or tile floors you may want to consider placing down rugs, towels, or blankets within the pen (which will also protect the rabbit from getting sore hocks) - just be sure to inspect them every so often to make the rabbit is not chewing them apart and swallowing pieces, which could lead to intestinal blockage. Many pet stores sell treats marketed at rabbit owners- such as yogurt drops, dried fruit, seed bars, corn cobs, or mineral blocks- that may be inappropriate or even dangerous. Many are too high in sugar or include ingredients unfit for rabbit digestive systems. Short term consequences can include gas, diarrhea, or GI stasis. Long term effects can include obesity, heart disease, fatty liver disease, and a shortened lifespan. 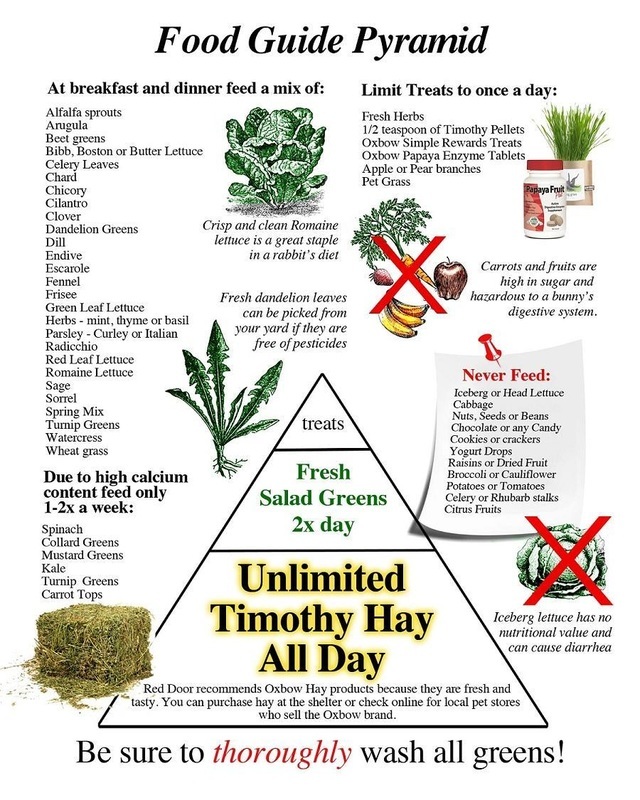 Don’t waste money on products like these- if you must give a treat, give a small amount of pellets or the occasional morsel of fresh fruit or carrot...but really, most rabbits appreciate a scratch on the head or a fresh salad just as much, if not more. Most rabbits do not enjoy being picked up and held. Being restrained may trigger the same feelings as when they are captured by a predator, and being picked up off the ground may feel comparable to being snatched by a bird of prey. Often rabbits will struggle, kick, and thrash when picked up. Be prepared for this- dropping your rabbit can cause serious, even fatal, injury to their delicate spine. Make sure you understand proper handling techniques before you attempt to lift your rabbit for the first time. With patience and practice, most rabbits can learn to (reluctantly) accept being held. Start by approaching your rabbit calmly and slowly. Gently stroke its head to reassure it. Place your dominant hand under their chest, then use your other hand to scoop up their rear end, supporting their hind legs. 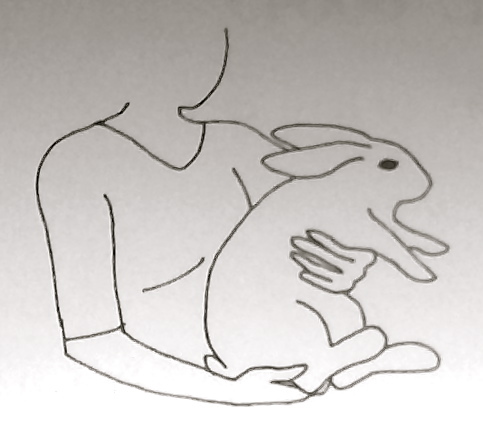 Hold the rabbit closely to your chest to provide more stability and control. When setting the rabbit back down, slowly bend your knees to lower yourself to the ground- be careful as you release them because many rabbits get very squirmy as they approach the floor. Never pick your rabbit up but the ears, legs, or scruff- this can cause pain and serious injury. If you are uncomfortable handling your rabbit, try transporting it in its litter box or carrier until you have both had more practice.